Naomi Fujimoto is Senior Editor at BeadStyle magazine. Her passion is charm bracelets, handmade ornaments, and mixed-breed dogs. She has over eight yuears experience designing and selling jewelry. This book includes the first two of her interests and a whole lot more. The format is set up for beginners with information on tools, findings, and a description of eight beads. There are certainly more beads but she didn’t want to overwhelm you. The step-by-step instructions are very clear, plus she gives some tips as well. I have only been beading about three years and I found the projects on my level. She has a project called a Lariat Necklace that I liked because it has simplicity and class. 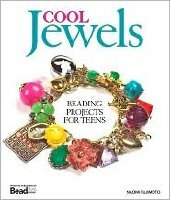 This is the first book I found that taught me how to make a bracelet using Memory Wire. Naomi has two projects in here: one uses wooden beads and the other uses crystals. She teaches you how to make your own earring wires using 20-gauge wire and lots of practice. She also teaches how to make head pins. Even though she is teaching teens, she also mentions how to add more chains, charms, and how to make a plain loop. At the end of the book she includes more ideas, stacking ring, snowflake, and belt. Just a reminder, make sure you look at the last few pages, because Naomi includes a list of where to shop on the computer. I really loved the book!